This caricature shows Mabel Constanduros (1880-1957) as Sarah Pennyfeather in No Sleep for the Wicked at the Oxford New Theatre on 12 May 1937. It was drawn by Gilbert Sommerlad (1904-1976), a rehearsal pianist and orchestral violinist at the Brighton Theatre Royal from 1932 until 1936, and at the Oxford New Theatre from 1936 for over forty years. Sommerlad sketched the stars on stage when he wasn't needed in the orchestra pit, compiling the sketches in a series of albums. The actress Mabel Constanduros was born in South London and trained at the Central School of Speech Training at London's Albert Hall. She made her first stage appearance at the London Coliseum in September 1929 and went on to play a variety of roles in London and on tour, including Anne of Cleves in The Rose Without a Thorn at the Duke of York's Theatre in November 1933. She became a radio celebrity after she began broadcasting her own sketches in 1925 and wrote the BBC radio series The Buggins Family in which she at first played the whole family, and became best known as Grandma Buggins. She wrote novels and short stories in addition to radio material, and appeared in films including The White Unicorn (1937) and Easy Money (1948). In 1953 she played Earthy Mangold in the BBC television's Worzel Gummidge Turns Detective. 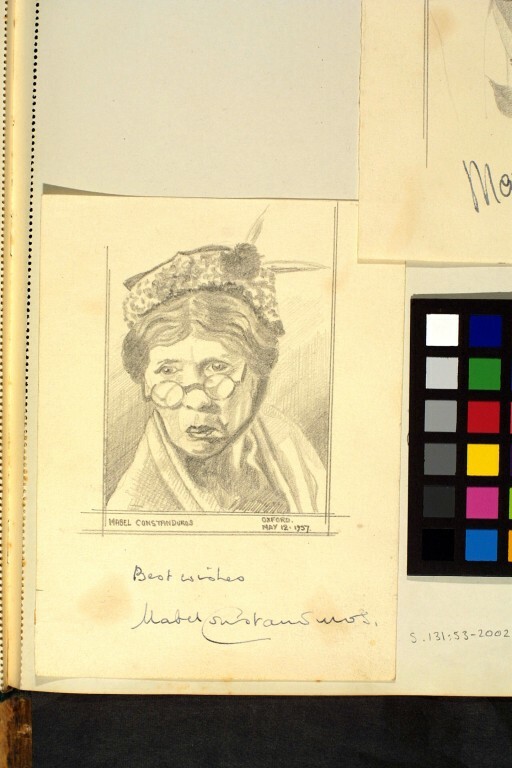 Pencil caricature of Mabel Constanduros, New Theatre Oxford, 12 May 1937. From a hard-backed sketch book containing caricatures of theatrical performers and entertainers drawn by Gilbert Sommerlad. MABEL CONSTANDUROS OXFORD MAY 12. 1937. Pencil inscription by Gilbert Sommerlad. Gilbert Sommerlad was a member of the resident orchestra at the New Theatre, Oxford when he drew this caricature.